Planning a vacation in Florida or the Caribbean? Before you go to the beach, however, you might want to consider that the hurricane season has just began, and you need to stay alert during the months from August until November. Experts say that during a typical hurricane season, there are usually 12 tropical storms, 6 of which turn into hurricanes with winds of 74 mph or greater and 3 are hurricane category 3 or higher with winds of at least 111 mph. In addition, up until now, Florida has a record of 8 years without a landfalling hurricane of category 3 or higher. And most experts are predicting a tamer-than-usual hurricane season for 2014. The best way to stay informed is in no doubt the regular checking of websites that post real-time weather forecasts and information in case of emergency. Organizations which provide life-saving instructions during natural disasters are aware that people’s lives could depend on their websites’ flawless performance, and that is why they are going the extra mile to keep their websites’ response time close to zero seconds and the availability - 100%. Still, however, even those websites could experience technical difficulties at times due to the extremely high web traffic. That is why we decided to monitor 5 of the most used websites for natural disasters and emergency situations. We will report their availability and uptime daily, throughout the whole season as this information may be useful to those having technical issues while using any of the monitored websites, or would like to check the time it’s taking to load a page of any of the websites and thus - how fast s/he could access the content. 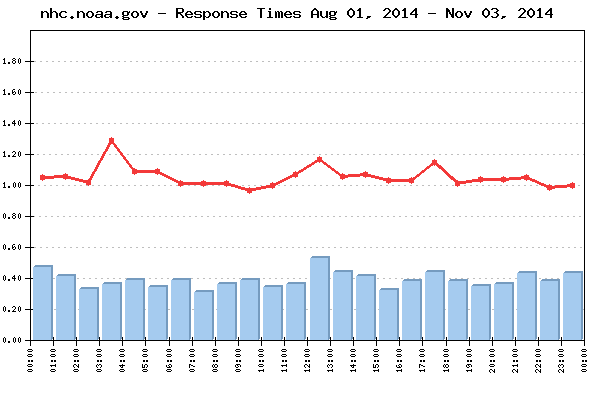 The daily Average Response time from all monitored websites was 1.156 sec. The Average Response time as measured from the US East Coast (Trumbull, CT) was: 1.873 sec. The Average Response time as measured from the US West Coast (San Francisco, CA) was: 0.992 sec. 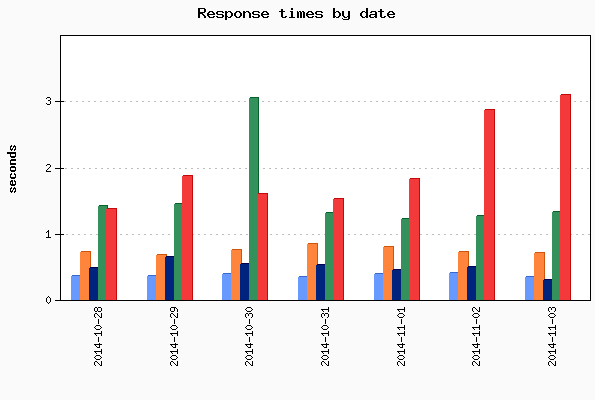 The Average Response time as measured from the US Central was (Chicago, IL): 0.603 sec. 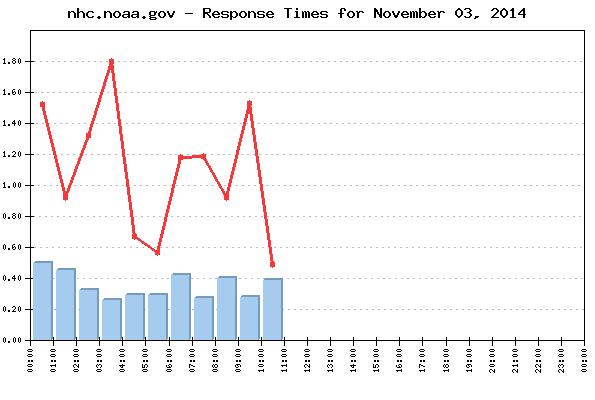 The Best Response time measured from US East Coast (Trumbull, CT): 0.231 sec. The Best Response time measured from US West Coast (San Francisco, CA): 0.355 sec. The Best Response time measured from US Central was (Chicago, IL): 0.238 sec. The typical shopping transaction took the least time for redcross.org visitors - 0.298 sec., while the visitors of salvationarmy.org had to be the most patient, as the shopping transaction there took in average of 3.093 sec. Four websites were available with no interruptions - 100%. Four websites' availability was above the average, while one site dragged the average down with below-the-average availability. No events of particular importance or possible negative impact on the online visitors' interaction with the Websites included into the 2014 Hurricane Season report were detected during the reported period, and according to WebSitePulse, the Group delivered the expected levels of End-User experience and Customer satisfaction.